Ever since the brackets were revealed on Selection Sunday, fans have been talking about Michigan State having to go through Duke to get to the Final Four - but there's a big hurdle in the way. FOX 47 News's Seth Wells tells us about the Spartans match up against Louisiana State on Friday night. WASHINGTON, DC — Ever since the brackets were revealed on Selection Sunday, fans have been talking about Michigan State having to go through Duke to get to the Final Four - but there's a big hurdle in the way. FOX 47 News's Seth Wells tells us about the Spartans match up against Louisiana State on Friday night. In just over 24 hours, Michigan State and LSU will face off for just the 2nd time in history, the other match up also came in the Sweet 16. That was back in 1979 when Magic Johnson and company rolled LSU on their way to the National Championship. The Spartans are hoping history can repeat itself, but they have a lot on their hands with the Tigers. 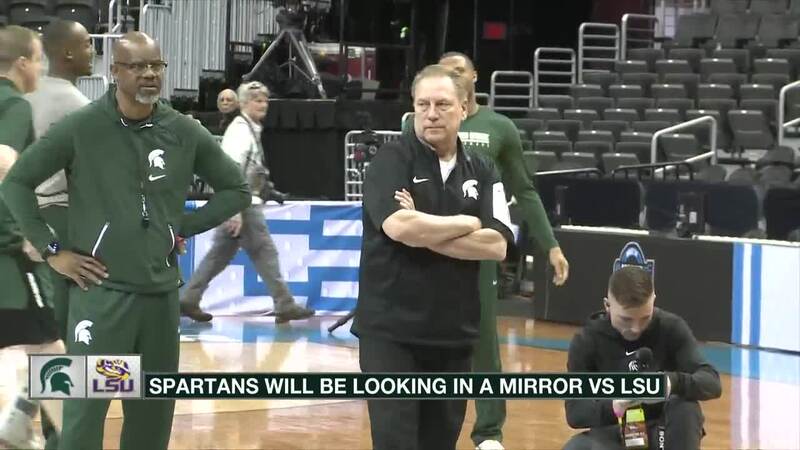 Tom Izzo, MSU Head Coach said, "I think they're the most athletic and big team we have played. I'm not as worried about the size inside as I am on the athleticism and size on the wing. That is where we are a little depleted right now." Cassius Winston, MSU Guard said, "Just taking care of the ball, you know whoever takes care of the ball is probably going to win this game. If we turn the ball over they're going to dunk it on the other end and if we take care of the ball we're a tough team to beat." Aaron Henry, MSU forward said, "They like to be physical and perform on both ends of the floor. Inside as well so we just have to be prepared for a lot of things." MSU and LSU tip off shortly after 7 p.m. on Friday. Michigan plays Thursday night in the Sweet 16. The Wolverines take on Texas Tech at 9:40. The winner plays either Gonzaga or Florida State on Saturday with a trip to the Final Four on the line.